In my 2nd year of film school one of the core assignments was to make an experimental film. As I remember it was all open concept, so you could pretty much do whatever you wanted to. I'm no experimental film buff, but the one thing that drives me crazy about avant-garde is that so many films just seem like random imagery that the filmmaker throws in, hoping that the audience or critics will give it meaning. I didn't want to do this. So in establishing my idea I got thinking about how I could create obvious symbols that would make my experiment a bit more accessible. I woke up in the middle of the night a few days after the project was assigned, and I'm not sure why exactly but I started writing. I was thinking about the piano that my parents had, and I started working out different patterns that I could make between the piano keys and my hands playing them. A list of comparisons and contrasts evolved into a symbolic depiction of how humans interact with the planet. With countless hours of revision, it was these random bits and pieces of concepts became the basis of my project, Keys to Existence. Everything seemed to go pretty fast after that. Suddenly I felt I had a fresh and exciting idea, although it's always tough to make others see what you're thinking right off the bat. I remember going around the table in production class to share what we all planned on doing, and I recall some blank expressions. "You're making an experimental film about playing the piano"? In retrospect, had I been on the other end of the table I probably would have questioned the exact same things. As I refined my idea, and worked out my finished storyboards and shot lists it became more clear that I'd come up with something pretty original. It also met my criteria for being meaningful and poignant without seeming too cryptic or unnecessarily arty for the purpose of faking a message. At the end of the semester my completed film received a 95% which is probably the highest mark I've ever got on such a major assignment in university. I'm pretty sure that was the highest mark of any assignment in our class, because as an added bonus I won the 'Jury Prize' that year (Best Personal Project in 2nd Year Production) as selected by my film profs. The award was a certificate and a secondhand trophy. This is the original 2004 version of Keys that I submitted in class. 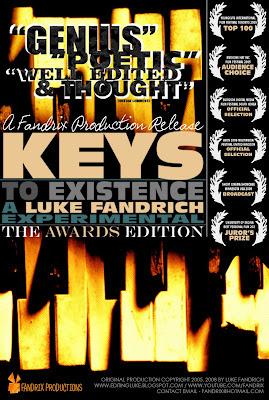 In the spring of 2005 I submitted Keys to Existence to the Medicine Hat Student Film Festival (back in my hometown) where I ended up winning 2nd place overall in the festival. However, the real highlight was winning the Audience Choice Award. That festival, although it was the first that I had ever taken part in, became the primer for several larger events. Over the summer of 2005, I decided to improve my short further by cleaning up some of the filters and adding several brand new scenes to broaden to the scope of the project. Due to my success at the MHFF I next submitted my film to the Youngcuts International Film Festival, a competition for filmmakers 25 and under held in Toronto that year. Out of hundreds of entrants, I received an 'Official Selection' as part of the Top 100 movies, which meant that my film was screened in a movie theatre for the event. All this was quite a rush, because for the first time I experienced what it was like to have the support of complete strangers. Even more exciting, and remember that this was before my blog, it was great to feel like I was actually doing something with my work besides storing it on a shelf. Several months later, I submitted Keys to BUDi2006 - an international digital media festival in Busan, South Korea. Out of 280 global submissions, I was thrilled when I heard that Keys to Existence was selected. Furthermore, out of 31 films in my category, I was shortlisted into the Top 7 and had my film played in an open exhibit with an estimated 10,000 people in attendance. *Update 2008: Thanks in large part to this blog and my YouTube channel, I was contacted directly to have Keys screened at a giant outdoor multi-media festival/concert in the UK this summer. Only days later I was contacted again to have my movie featured in a short film series broadcast in the USA. See Mom and Dad? Those piano lessons in elementary school paid off after all. This project continues to mean a lot to me because it symbolizes the start of my film festival pursuits and it got me thinking about my career seriously. Perhaps most significant though, Keys has influenced everything I've made since. It was this project that gave me the confidence to acknowledge my own potential and push through the criticisms and doubt that hit head on in early film school. Although filmmaking is as simple as merely filming something, being a filmmaker is something else; Keys helped me realize that. Without further delay, please enjoy Keys to Existence. Still one of my flavourites! awwww, it's one of my flavourites too, haha. Nice work, this is a great experimental. Great use of symbolism, sounds, and editing style. It sounds like this short has really helped you get started in the industry. Feel free to check out my blog page as well and tell me what you think...I'm really new here so I'll be posting lots more soon. Peace! I really enjoyed this! Good work luke, keep it up. Congratulations to you on your accolades. The video Sure deserved it and sure why not. I am not much of a movie critique but I must admit that the sounds and the editing was very good and it is the music that touched my soul. You are very creative Luke and I am sure you will reach Greater heights than what you already have achieved.